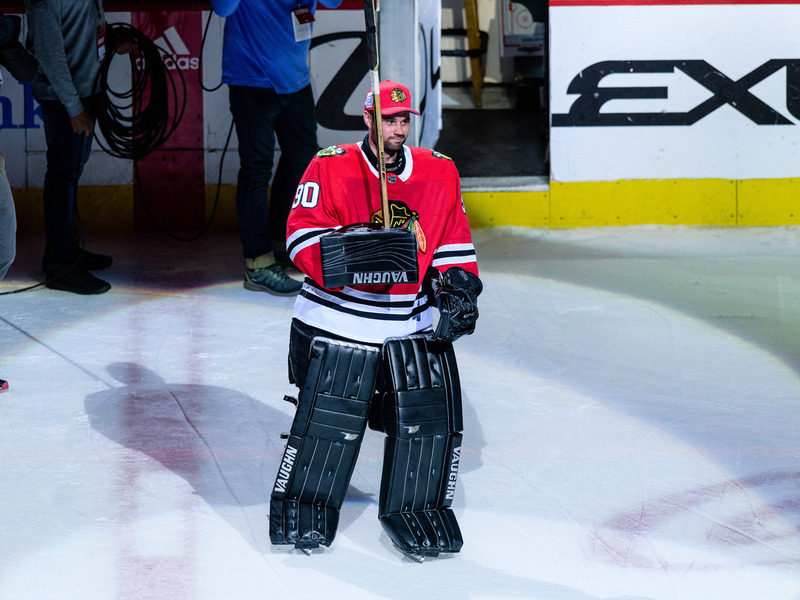 Blackhawks Called In An Accountant As Emergency Goalie — And He Crushed It : The Two-Way "The initial shock happened when I had to dress," Scott Foster said after the Blackhawks' 6-2 victory. "You just kind of black out after that." Scott Foster, an accountant who plays in an amateur recreational hockey league, was suddenly called in as an emergency backup goalie for the Chicago Blackhawks on Thursday night. Scott Foster is a 36-year-old accountant who lives in Oak Park, Ill. More than a decade ago, he was goalie on Western Michigan's hockey team. These days he plays in a rec league at a rink called Johnny's Icehouse. That rink is just a few blocks east of the arena where the Chicago Blackhawks play — and where, on Thursday night, Foster became a legend. Just before faceoff against the Winnipeg Jets, the Blackhawks tweeted that they had signed Foster to an amateur tryout contract to be the team's emergency backup goaltender: EBUG, for short. The team pointed to his .875 save percentage at Western Michigan University and his earlier career for the Petrolia Jets of the Western Ontario Hockey League. The #Blackhawks have signed Scott Foster to an ATO today to serve in an emergency backup role. Foster, 36, played 4 seasons at @WMUHockey (2002-06), posting a record of 20-22-6 with an .875 save percentage and 3.44 GAA. The one-day contracts are generally unpaid, and Foster, a father of two young children, has come to the United Center before to be on call as backup goalie. "Usually," he said, "I just head upstairs, watch the game from the press box, have a bite to eat, and head home." The Hawks needed to have Foster around, just in case, because they were a little shorthanded on goalies since their standout netminder, Corey Crawford, is injured and Anton Forsberg got hurt just before the game. Then fill-in goalie Collin Delia, making his own NHL debut, had to leave the game in the third period due to cramping. That left just one man to preserve the Hawks' lead. "I don't think I heard anything other than, 'Put your helmet on,' " Foster said later. With Blackhawks coach Joel Quenneville grinning, Foster took the ice. And he stopped one shot after another — seven times blocking the Jets' attempts to score. In a moment most rec-league players can recognize from our wildest dreams, the fans in the United Center began chanting his name. AND A SAVE BY FOSTER! With Foster's able handling in the net, the Hawks sealed the win, 6-2. "The initial shock happened when I had to dress," Foster told delighted reporters after the game. "You just kind of black out after that." Foster even won the team belt, which goes to the player of the game. "I think I'm just about hitting my prime," he joked. For the moment, he has incredible (if minimal) stats: his save percentage is 1.000. That's even higher than the Hawks' Corey Crawford, who has twice won the NHL's goalkeeping trophy. So where does the beer-league-turned-big-league hero go from here? "You think there'd be a lot of pressure," Foster said. "But, really, tomorrow I'm going to wake up, I'm going to button up my shirt, and I'm going to go back to my day job. So what pressure is there for me? "You just keep grinding away in men's league, and eventually you'll get your shot," he deadpanned. His men's league, by the way, was very proud.